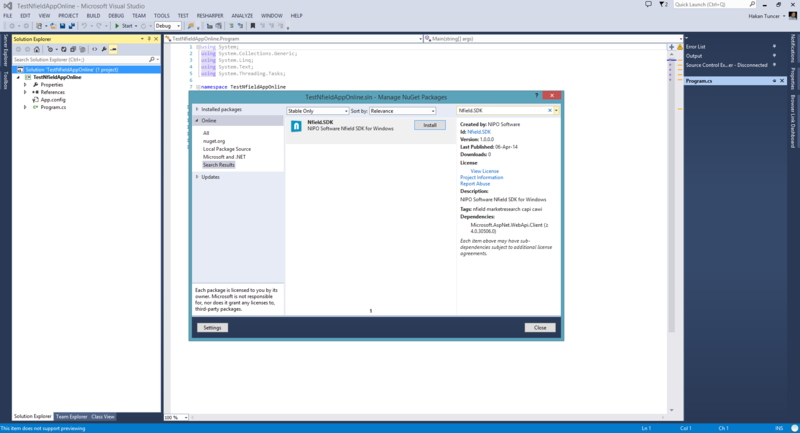 In a previous blog post I covered the step by step process of publishing Nfield.SDK to NuGet. After publishing Nfield.SDK, a natural follow up is to create a simple app that installs Nfield.SDK through NuGet and does something useful with it. What is better than a windows console application to prove that it's really easy to install and use Nfield.SDK. 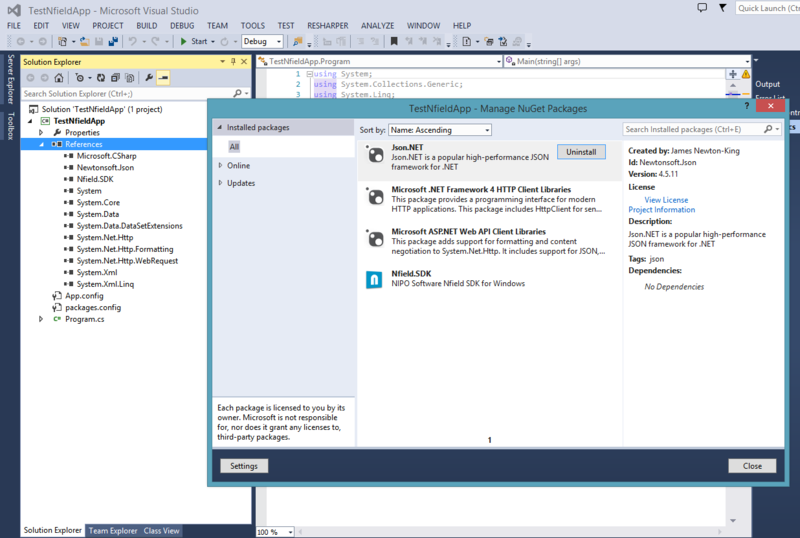 Let's fire up Visual Studio, create a Console Application and install Nfield.SDK through NuGet. After clicking install, I see that Nfield.SDK is automatically installed and referenced from my project. Wait a moment... I only installed Nfield.SDK but now I see that "Json.NET", "Microsoft ASP.NET Web API Client Libraries" and "Microsoft .NET Framework 4 HTTP Client Libraries" also got installed. As discussed in the previos blog post NuGet is smart enough to recursively install packages and all of their dependencies. 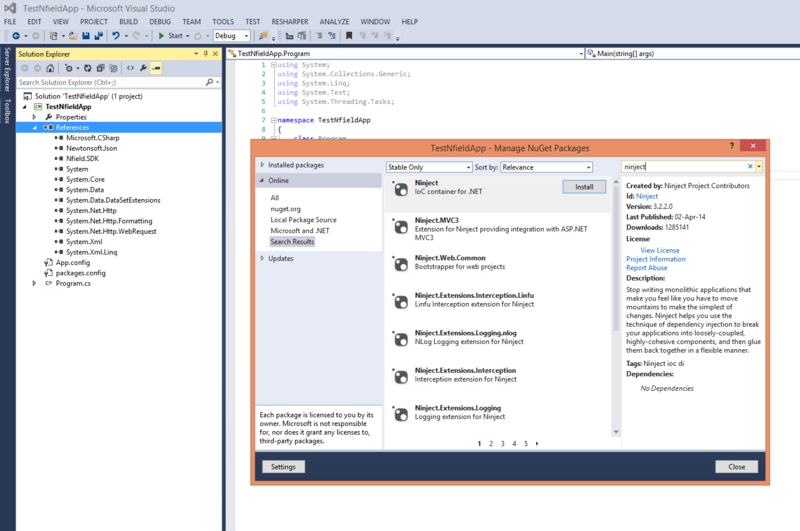 The point here is that NuGet took care of all the dependencies of my application in one click of an install button. Focusing back to the console application, I'm going to create an app that is going to add an interviewer to my domain on Nfield. In order to do that, I need one more ingredient to take care of: an Inversion of Control Container. /// Method that registers all known types by calling the delegates provided. /// This method must be called before using the SDK. If you don't know what an IoC Container is there is nothing to worry about. If you just copy the short setup code that I'm going to share in a second you're ready to use Nfield.SDK. You don't have to use IoC for your application logic. Again, if you're new to IoC Containers I recommend reading this paper from Martin Fowler. An IoC container that we frequently use at NIPO Software is Ninject. I'll install it to my project using NuGet again (only the top one in the list below is sufficient). // First step is to get an INfieldConnection which provides services used for data access and manipulation. // User must sign in to the Nfield server with the appropriate credentials prior to using any of the services. /// Example of initializing the SDK with Ninject as the IoC container. After I run this application and go to the interviewers page of my domain, I see that the inverviewer I just added is now listed there. Below is a screenshot from the beta version of Nfield Management Interface (authentication required). The code I used gets a reference to INfieldInterviewersService and adds an interviewer using this interface. Nfield.SDK has many service interfaces that allow clients to control various aspects of their research projects. I think that's a post. I hope I could shed some light on getting up and running with Nfield.SDK and the various things that you can do with it.